B. N. Chatterjee was a funny looking man. Sitting there on his arm chair, the cane weave on the back creaked slightly as he shifted in his seat, he leaned forward every few minutes to relight the tobacco in his pipe. He dressed in a white kurta pajama and an ivory waistcoat with black piping, a uniform of sorts. A very thin, black-dyed mustache sat near his nose, a distance away from his thin, purplish lips. I was eleven and this was my first trip to the school music room. A wonderful little place filled with sitars, mandolins, harmoniums, tablas and other delightful instruments, all begging me to touch them. I couldn’t resist, no one could, a ploink here, a thud there, everyone wanted to give it a go. Till some idiot would drop an instrument and Mr. Chatterjee would growl and in Bengali accented English, ask everyone to get out. But he was so funny looking, with his jet black hair (with some dye staining his scalp), his thick black glasses and his flaming red Bajaj scooter, that no one took him seriously. Much as he probably hated it, he knew the kids made fun of him and was quietly resigned to that fact. Soon after my first trip to the music room, I became painfully aware of my limitations as a musician. I had harbored dreams of being able to pick up a guitar and strum out a tune, on a beach at night, surrounded by girls looking at me wistfully, warmed by a bonfire. And here I was, plucking nervously on a guitar string, with Chatto (that’s what we called him), looking at me with disgust, like I was some rotten fish. It didn’t help that I kept losing my plucker in the hole of the guitar and spent half the hour of music class, trying to get it out. As the months went by, preparations for the annual Founder’s day orchestra performance began in full swing. Devoid of any musical talent, I was relegated to the back row, about 15 of us with some coconut shaped instrument filled with beads. We would be providing the super important background ‘chickachika’ sounds while the talented musicians took the foreground and played the actual Raaga. There were about four tabla players. 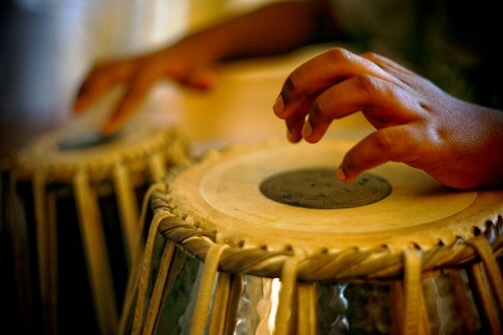 A couple of days before the show, one of the tabla players fell ill and had to bow out. Distressed by the lack of symmetry on stage, Chatto calls me up front during one of the practices and asks me to sit in the empty place. He politely asks me not to actually play the tabla but just pretend to do the ‘dhak dhin’ finger motion, gently to the rhythm. Piece of cake. I’m awesome at pretend playing. I could sense his anxiety but I was just so thrilled to be in the front row. Founder’s day was upon us. The show went off beautifully. The orchestra played proudly, practiced to perfection. I pretended to play, smiling for the cameras, trying to search for people I knew in the audience and make gleeful eye contact. After the performance we all gathered backstage, congratulating each other. Chatto was there, saying ‘Shabaash’ to his star pupils. Then, just as we were all about to disperse, he grabs my hand and says loudly, “I love this boy. He doesn’t know T of Tabla but he played like he was Zakir Hussain. Swinging his head and everything.” I didn’t know how to react, mainly because I didn’t know if he was being sarcastic or ridiculing me. But he kept going and there wasn’t any sarcasm in his voice. Mr. Chatterjee found it incredibly endearing that I would pretend-play with flair. Deeply embarrassed as I was that night, a part of me felt incredibly reassured. Ever since I could remember, I’ve always loved being in the spotlight. But people always tell you to shun it, to work quietly, to curb that natural instinct to want to shine. And here was this man, so used to ridicule, from his colleagues and his students, who didn’t feel the need to trample over a little boy who wanted to just feel like he was playing brilliantly. He let me shine that night. And he loved me for it. We had a different equation from that day on. I never ridiculed Mr. Chatterjee and he always jokingly called me Zakir Hussain. I played in the school orchestra for 4 years, moving my way up to the mandolin. I never really was a gifted musician but I practiced long and hard, committed the raagas to physical memory and never made a mistake during a performance. I spent an incredible amount of my free time in that music room, sometimes practicing, but most times, just taking to Chatto. And while walking to the dorm, if he happened to zip by on his scooter, while most students would shout “Eh Chatto” behind his back, I’d keep my silence. I knew a side of him that others weren’t fortunate enough to know. Life is a bully. It makes us paranoid and superstitious. We trade in our spark for a more socially acceptable way of life. I fall into that trap too. But some days, and those days come infrequently now, I find myself often revisiting that October night in 1992. Chatto grabbing my arm, saying he loved this boy, who couldn’t play but wanted to be Zakir Hussain. It silences that nagging, doubtful voice in my head. It reinforces who I was born to be. And I step into the light again. Previous PostHiding in the cold.Next PostAre we happy?